“Riding is about freedom, fun, visiting and learning about new places, meeting people and make new friends”. It requires 2 luxurious and comfortable wheels such as Harley Davidson Electra Glide, Indian Roadmaster or Honda Goldwing. You will start a love affair with beautiful America seen on 2 luxurious wheels - THIS is an experience that we want to share with you! 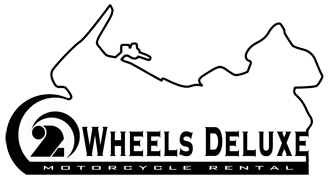 2 WHEELS DELUXE is at your service offering what you need for your dream to come true since 2010: WE offer fully equipped touring motorcycles- 1800 cc Honda Goldwing, 111cu.in. Indian Roadmaster or 107cu.in. Harley Davidson Electra Glide Ultra Classic, to visit United States. We provide also ALL INCLUSIVE TOURS: guided or self-guided (custom designed itinerary downloaded in GPS). We specialize in design these tours, to fit your budget and time frame including lodging in places we personally experience and are "BIKER FRIENDLY" . For a complete vacation package on 2 WHEELS we can offer also a vacation apartment package for two in trendy Belmont Shore of Long Beach. It's a lot to ride and see in Southern California! This may be one of your dreams: a vacation apartment in sunny California and a fully equipped Touring Motorcycle waiting for you in the garage. 2 WHEELS DELUXE is customer friendly oriented company and we handle each and every booking with personal attention. Our motorcycles are known for their reliability and comfort always serviced by an authorized dealer. Honda Goldwing, Indian Roadmaster and Harley Davidson Electra Glide Ultra Classic Limited Edition, offered by 2 WHEELS DELUXE are equipped with everything essential for long and comfortable rides. Unlimited miles and no hourly charges (unless required).